There’s something in the air and like the best of things, it’s exciting and scary at the same time. More and more articles like this one and this one and even this one proclaim the death of so many jobs over the next 20 years and magazines like this one explain why people not learning to adapt will be disastrous for everyone, especially current school kids. The major problem for school children is that traditionally, the classroom doesn’t demand they practice adapting to a situation or problem solve open-ended enough scenarios. It’s always been mostly a matter of fitting in and following the guidelines laid out by the teacher. It’s heartening to read stories like this one that show things are changing but these examples still exist as a minority in education. This is where I’ve witnessed the iPad itself shift the learning landscape over the 4 years I’ve been involved with it. They have helped but also demanded adaptation on multiple levels from both teacher and student. 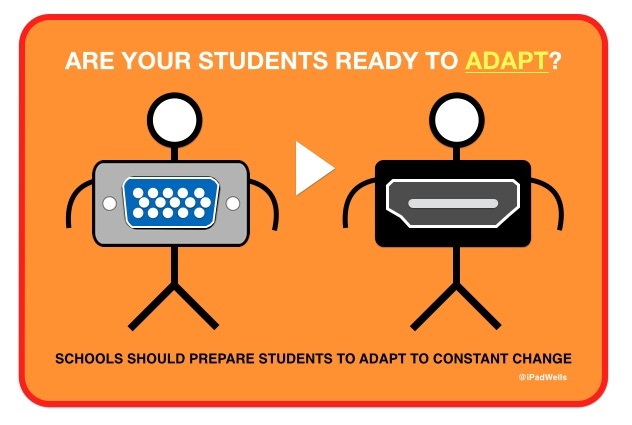 Here’s where iPads have helped in developing what might just be the key skill for 21st century existence: Adaptability. Stage one – adapt to electronic workflow. The multiple benefits from working electronically have encouraged both students and educators to adapt to a new set of skills and tools for sharing and collaborating. Many teachers have found this first step to be a major shift in how they prepare and manage the learning environment. Although young people surposedly have the upper hand in digital skills, they too have learnt many skills in dealing with people (their teachers) who might be less comfortable with tech. Through suggestions and shared experience many have learnt to adapt to a new format where teacher and learners build a workflow together. The iPad learning environment does not sit still and each week there are new posibilities. Many classrooms have students who enthuse over what the latest and best apps are and this has the tendency to constantly threaten the status quo. I welcome this threat and accept that there will often be a better way to create or connect but for some teachers this too has been a situation they have had to deal with or adapt to. My philosophy is that if an individual believes they can present the result to me without me having to do too much, then go for it. If they fail, they’ll learn a number of lessons. After a while, in some cases two years, teachers who become more comfortable with the iPad’s capabilities and workflow can start to adapt their demands and expect more engaging, challenging and collaborative output from the class. With a more confident teacher in the room, students have to raise their game and realise that the death of one-size-fits-all education is more fun but also more demanding. Uploading, sharing and commenting is just they way the world works these days. Our work and home life expect it of all of us and most have adapted with relative ease. Still some teachers have kept their school workflows as they were pre-Facebook and sadly, I have found many teenagers are still in the dark when it comes to realising that the skills they demonstrate all day on social media can and are used productively at work all around the world. By helping me develop a new approach and new priorities in my teaching, the iPad has been a major factor in shifting the students into the driving seat of their own learning. This too is something we have all had to adapt to. I would hope that soon I will be teaching children who have had enough experience of adapting and taking charge of their own learning that I will feel confident that I have been part of genuinely preparing a generation for the very much unknown future they are leaving my classroom to tackle. Having to adapt to a one-to-one device and mobile environment, with all its challenges is enough of a reason to make the shift, whether one feels ready or not. Unless we allow young people to experience, fail and triumph in using mobile devices for productivity and creative output, we will rob them of the key experience itself: having to adapt.